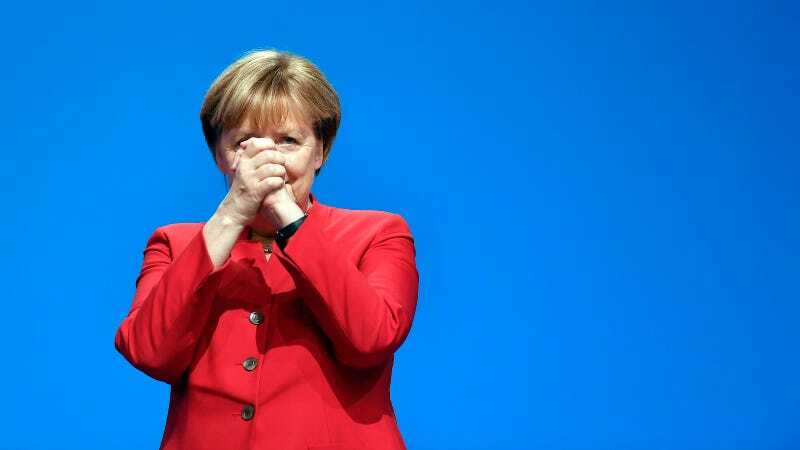 Merkel’s decision to admit more than a million refugees into Germany in 2015 has dogged her politically, and she’s facing a tougher-than-usual reelection bid for her fourth term in office. Although she has refused to put a cap on the number of refugees allowed into the country and maintained the importance of “value-based openness,” she’s also said that “no one wants a repeat on last year’s situation” and promised that some asylum seekers in Germany will eventually face deportation. And now, the Washington Post reports that Merkel is working to appeal to the conservative elements of her party by calling for a partial ban on garments that are hardly ubiquitous—according to the Post, some experts suggest that only a few hundred people at most wear a full burqa, out of a Muslim population of 4.7 million. Until further detail of the motion emerges, Merkel’s comments represent a change in rhetoric rather than a full U-turn: back in September, the chancellor had called for stricter guidelines on official situations where wearing a full face veil was not permissible, while also stating that “lived diversity is the logical consequence of freedom”. Similar to the burkini ban in France—which involved a mysterious garment that some lawmakers couldn’t even describe, and didn’t end up being so much about safety as about the public humiliation of Muslim women—this statement, accompanied by a decrial of Sharia law, endeavors to police women’s clothing in a symbolic gesture of cultural control. Politico reports that of all the agenda items Merkel laid out during her talk, this is what received the strongest applause.